After the initial invention of thread and needles, advances in hand-sewing went pretty slowly. Read on to see what happened in between the time that needles were invented to the time when sewing machines were invented. After the initial invention of thread and needles, advances in hand-sewing went pretty slowly. I guess it wasn’t broken, so they didn’t care to fix it. 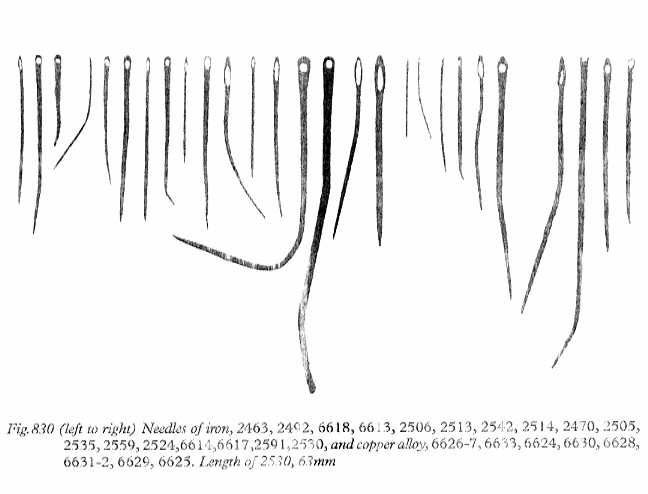 In 17,500 BCE, the first needles with eyes emerged. Before this, needles had a split head that gripped the thread. Without ever having sewn with a needle that didn’t have an eye, I can only imagine that it would be pretty difficult because the thread or string would repeatedly come out of the part that gripped it. Copper was discovered around 9,000 BCE, as was the process of spinning thread from wool or linen and weaving cloth out of it. Five thousand years after that, copper needles were replaced, and bronze ones were made and started being used. It’s thought that this development first occurred in Armenia. Iron was used as long ago as 2,500 BCE, but people didn’t learn the secret of hardening iron by cooling it down quickly until around 1,400 BCE. This was first discovered in West Asia and Eastern Europe and it spread from this area farther into Western Europe around 1,200 BCE. The next advance after this wasn’t until 60 AD, when embroidery might have discovered by “Phrygier”. Every source I have read includes a line with almost the exact same wording as this, but none expand on who Phrygier was. I have googled the name and found nothing. We seem to not know much, if anything, about Phrygier, whether it was one person, a group of people, or even a country. There seems to be something called Phrygian Embroidery, which would be my best guess as to what this refers to. But Phrygian Embroidery is mentioned in an account made by someone named Pliny the Elder around 60 AD. Phrygia was a kingdom -- later on becoming just a region -- in what is now Turkey. Phrygia was the place that thrived under the rule of King Midas, not the one from the myths, but thought to be a descendent of the Midas that the gold myth was based on. One source claims that the needle was advertised for the first time in China around 1,200 AD, but I couldn’t find any others to verify this information. There’s another long break in sewing history before it picks back up with German inventor Charles Weisenthal. In 1755, he took out a patent for a needle that would function in a mechanical sewing machine, but there was no mention of the machine that would go with it. Not long after, in 1800, a German textile worker named Balthasar Krems came up with the idea of a needle that had the eye close to the point. As those of you who sew know, this is how the modern sewing machine needle is set up. Krem’s idea paved the way for mechanization of sewing worldwide with his tiny tweak to an ancient tool. Make sure to check out Part 3 of 6! A list of the websites referenced will be posted at the end of Part 6.